Contest now closed, winner will be announced in a few minutes. Darn camera cord!! Thanks for offering a giveaway! Cool. I would love to win this! Thanks for a great website. I didn't know about the recipe book! What an awesome giveaway. I didn't know about the recipe book. What an awesome giveaway! I would love to be a winner this week! Always a delight to see your selections! Surprises like this are always exciting, please count me in. Count me in - what a nice giveaway! these would be wonderful! I so enjoy your blog and all the treasures you find in books. Thank you! You had me at your two books - count me in please! Intriguing. Sign me up, please. All that and a surprise too? Count me in! Hi! Extraordinary surprise. I love it! Vintage books are always awesome! I love surprises and the surprise being more books just makes it that much better! Thanks for this giveaway! Surprises and recipes? Pick me! Christmas in September...I love it. Please enter me in this week's Giveaway. Thank you! Would love a signed copy of your books! Of all the giveaways you have done I want this one the most, since it has your books in it! I would love to win this great giveaway. 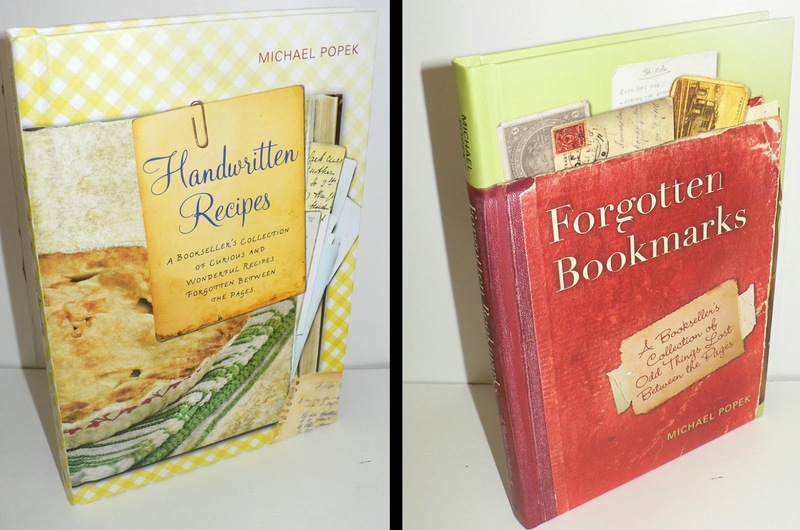 It would be such fun to win your books, Michael. Thank you for offering. I enjoy reading the forgotten bookmarks that you find - you have me looking in old books for the same. Please enter me in your give away. I would love a sign set of your books! Who wouldn't! haha! This is so cool! I'm so happy for you. Squee....i'm sure it will be an awesome collection! Please count me in. What a generous giveaway and I love surprises!! These books would make my day! Fabulous giveaway! I love your posts. Entering. Wish me luck! I love surprises and old books. Thank you for all the giveaways. Thanks for entering me in the give away. I always enjoy seeing your posts. I can never remember the time difference! I may be too late but I have to try--awesome giveaway! Great giveaway! The whole package looks great, including the super-secret surprise!